Pumpkin gelato is a melt in your mouth dessert that celebrates the season of all things pumpkin! Ice cream and gelato are not only summertime treats. 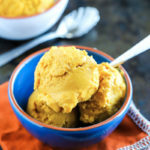 This pumpkin gelato is the perfect after dinner bite as we move into autumn. Thanks to Amanda for sharing her beautiful site with me today. My name is Holly and I share dessert recipes at A Baker’s House. Did you catch my last recipe for Gluten Free Apple Crumble? Today we move from apples to pumpkins. What a flavorful time of year! Gelato is an Italian type of dessert that is made in a similar method to ice cream. The ingredients are slightly different– there are usually no eggs and that ratio of cream to whole milk is different as compared to ice cream. 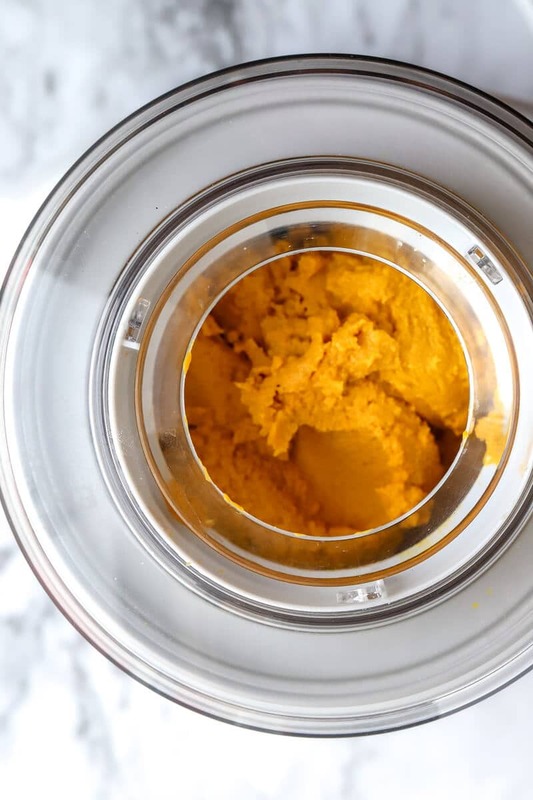 This base for this pumpkin gelato is easily made in a blender then churned in an ice cream maker. 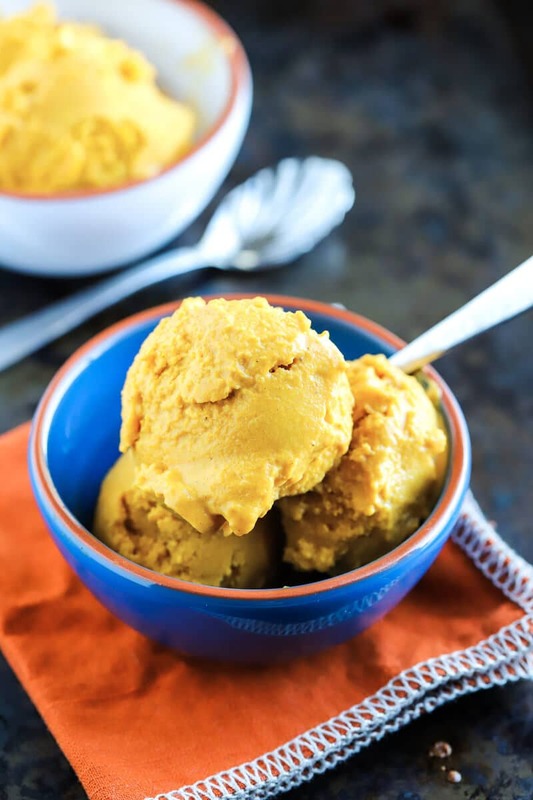 Although you’ll need to plan ahead for the prep time, having a make ahead dessert waiting for you in the freezer makes this pumpkin gelato ideal for entertaining. The blender and ice cream maker literally does all the work! Little effort on your end! Pumpkin, Pumpkin, Pumpkin! Fall flavor in every bite of this recipe! Plan ahead: the canister for the ice cream maker will need to be frozen at least 24 hours ahead of time. 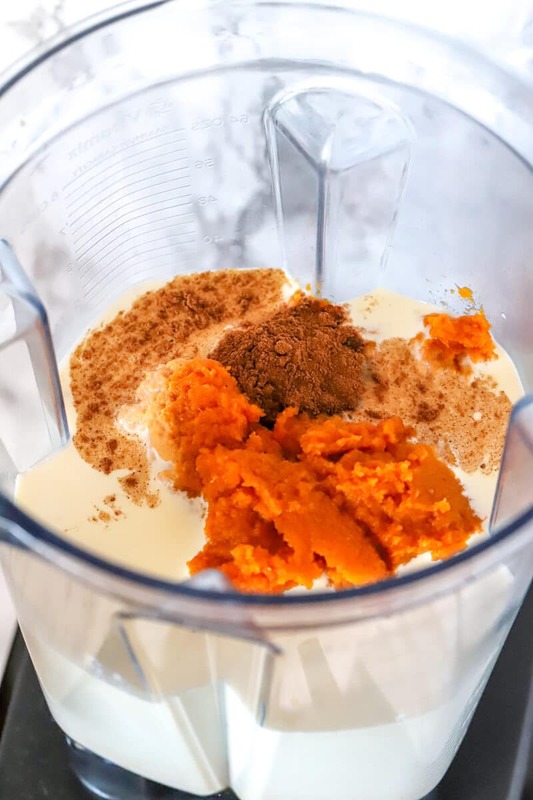 Blend all of the ingredients until smooth. It’s like you are making a smoothie or milkshake. Actually, a pumpkin pie milkshake sounds pretty good too! You could process this mixture right away, but the texture of your gelato will be creamier if you take the time to refrigerate this mixture for 4-6 hours or even overnight. Pour the cold mixture into your ice cream maker. Each ice cream maker is different but I found that churning for about 15 minutes was perfect. This is the texture of the mixture when you first add it to the ice cream maker. Looks delish, right?!?! And look at how the texture changes after only 15 minutes! Making gelato or ice cream is a fun activity to share with your kids because it is fascinating to watch the gelato develop right before your eyes. Unlike baking where your baked goods are hidden in the oven, making gelato and ice cream is a hands-on activity you can watch together as it happens. The texture of gelato is creamier than ice cream and you should serve gelato at a warmer temperature. It’s lovely served right after churning in the ice cream maker but can also be frozen and shared later. If you are serving gelato from the freezer, let is sit on the countertop for 15 minutes before scooping so that you achieve that creamy result. Looking for an Ice Cream Maker? Check out this one! Great topping suggestions for this pumpkin gelato include pepitas (pumpkin seeds) and caramel sauce. Let’s Make More Pumpkin Recipes! Pumpkin macarons are a festive, fall treat. Decorate with edible markers to bring these jack-0-lanterns to life! Pumpkin butter is THE recipe to make in your slow cooker this season. Your house will smell amazing! How cute are these Pumpkin Spritz Cookies! Your cookie press doesn’t have to collect dust only to be used around the holidays. Pumpkins are perfect for fall! Such an easy and simple fall recipe!! You’re going to LOVE this sweet treat!! Did you find this blog post and these step-by-step instructions helpful? 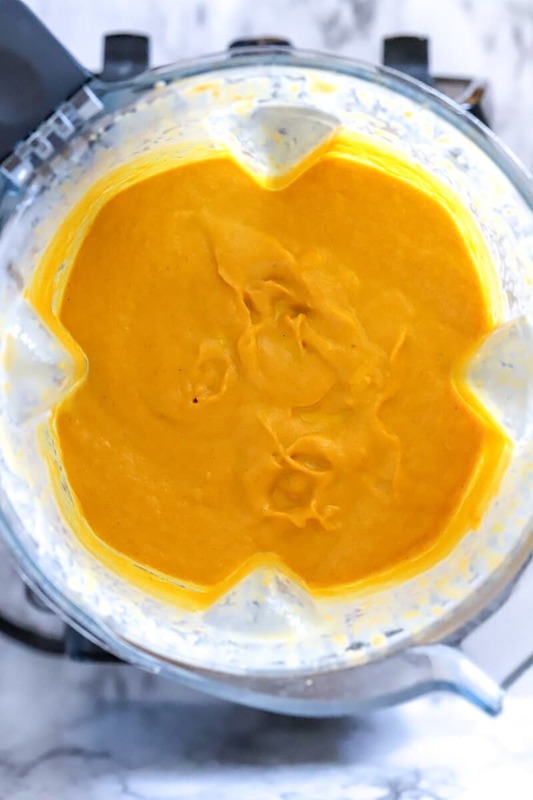 If you’ve tried my Pumpkin Gelato then don’t forget to rate the recipe and let me know how it turned out in the comments below! I love hearing from you! You can also sign up for my newsletter on my website here and FOLLOW ME on FACEBOOK, TWITTER, INSTAGRAM and PINTEREST to see more delicious food I’m creating! Pumpkin gelato is a melt-in-your-mouth dessert that celebrates this season of all things pumpkin! Freeze the ice cream canister for 24 hours. Combine all the ingredients in a high speed blender. Cool in the refrigerator overnight or at least 4-6 hours. Follow the instructions for your ice cream maker. This gelato was churned for 15 minutes. Serve immediately or freeze. When you are ready to enjoy the gelato, let the gelato sit at room temperature for 15 minutes before serving. Plan ahead: You'll need to freezer your ice cream canister overnight. 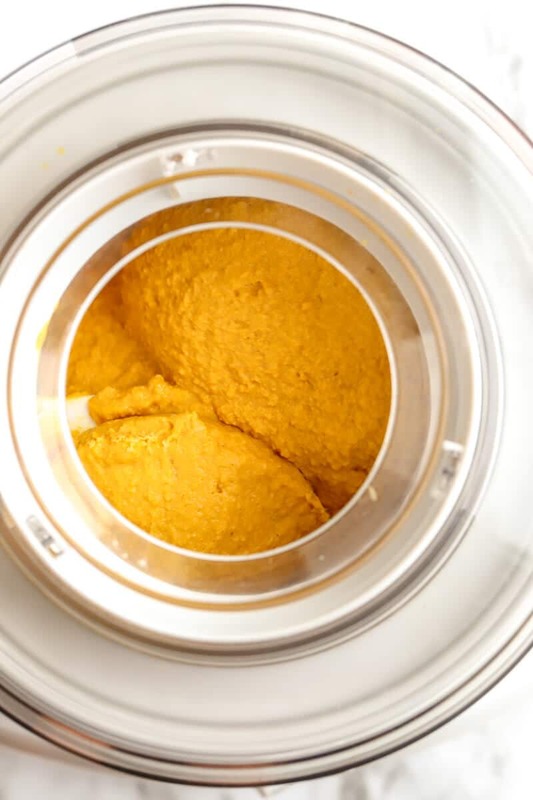 Also, the pumpkin gelato mixture should be cooled 4-6 hours or overnight in the refrigerator before churning in the ice cream maker. Holly grew up as a member of the Baker family, maybe that is where she got her sweet tooth! She is happiest sharing her desserts with others and loves to dive into cookbooks the way others might get lost in the latest mystery novel. Holly lives in Colorado where she enjoys playing with her two boys ages 9 and 13, practicing yoga, golfing and, of course, eating dessert first! I have never tried pumpkin gelato before!! Must try it out as I LOVE pumpkin! Ooh, pumpkin gelato – what a tasty treat! My family would love this I’m sure and with just 5 ingredients too. Sounds and looks great!